MOSCOW, April 24. /TASS/. 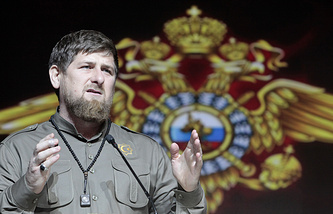 Chechen head Ramzan Kadyrov has quashed rumors that legal initiatives are being prepared in the region to permit polygamy, he told Rossiya 24 TV channel in an interview. "I didn’t say that," Kadyrov said in response to a reporter’s question on plans to introduce polygamy in the region. "It is not me who gives permission to a Muslim. It is Almighty God who permits to have four wives." "It is not under discussion at the legal level, but if you love someone, you should marry and support her," the Chechen head added. "We are not saying that he [a husband - TASS] should take all his four fives to a vital records office and register them. Call her any name, but, according to our religion, she is a lawful wife. And a vital records office is the first step made by the law to destroy the family." In his opinion, vital records offices were established for "malicious purposes" and are the first sign that there is no confidence between a man and a woman.